Canan Dagdeviren was born in 1985 in Istanbul, Turkey. Canan obtained her B.Sc. in Physics Engineering from Hacettepe University in Ankara. She was awarded with full-scholarship throughout her M.Sc. studies in Materials Science and Engineering at Sabanci University in Istanbul. 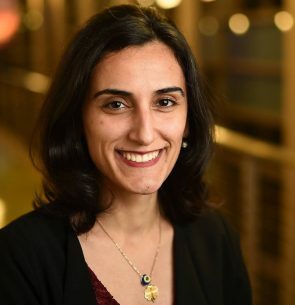 As being the top of the list in her field to be entitled to a Fulbright Doctoral Fellow, which was given for the first time in Turkey in 2009, she pursued her Ph.D. in Material Science and Engineering at the University of Illinois at Urbana-Champaign under supervision of Prof. John A. Rogers. Canan’s research experience focused on the applications of active piezoelectric materials and patterning techniques for ‘unusual’ electronic devices with an emphasis on bio-integrated systems. Her collective Ph.D. research has implications across a variety of sensors and energy harvesting components for self-powered cardiac pacemakers, multi-functional cardiac vessel stents, non-invasive/wearable/epidermal blood pressure sensors, and skin cancer detection bio-patches. Canan received her Ph.D in December, 2014. Dagdeviren is currently a postdoctoral research associate in The David H. Koch Institute for Integrative Cancer Research of MIT, working with Prof. Robert Langer. She also collaborates with Prof. Michael Cima and Prof. Ann Graybiel at McGovern Institute for Brain Research of MIT. Recently, Canan has been named a Junior Fellow in the Society of Fellows at Harvard University, as being selected the first scientist from Turkey in the history. Currently, she has 22 journal papers, is inventor on 3 patent applications, and holds over 35 prestigious awards including; 2015 MIT Technology Review Award for Innovators under 35 (Inventor), Materials Research Society Grad Student Awards (Fall & Spring Meetings, 2014), MIT Technology Review Award for Innovators under 35 (MIT TR35) in Turkey, Named as The Innovator of 2014 among the first generation MIT TR35 Turkey, Illinois Innovation Prize, Turkish American Scientists & Scholars Association (TASSA) Young Scholar Award, Racheff-Intel Award for Outstanding Materials Research, Forbes 30 Under 30 list in Science: Young Scientists Who Are Changing the World.